We create custom costume accessories which can be used for cosplay, film, and more. We also create products that fans love including vinyl decals. Attention geeks... We are proud to announce THE MYSTERY BOX! 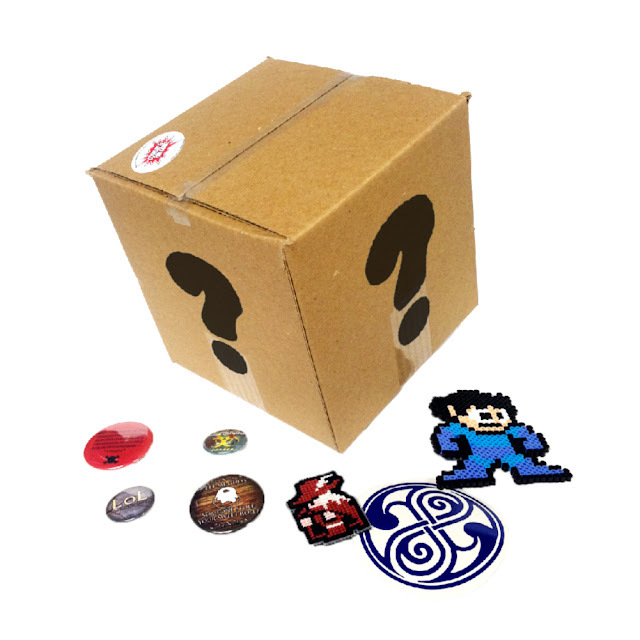 If you love video games, science fiction, manga, and anime, then this mystery box is for you. Each box includes hand picked buttons, a vinyl decal sticker, and pixel art secretly selected by our staff of geek experts just for you based on the edition you choose. Check out the product image above for an EXAMPLE of the item styles you could receive. Because what's inside the box is a mystery, we cannot guarantee the exact styles you will get. However, you are guaranteed to receive four (4) Pinback Buttons, one (1) Bead Pixel Art, one (1) Cross Stitch Pixel Art, and one (1) Vinyl Decal. US buyers will receive FREE shipping and international buyers will get discounted shipping. The Mystery Box is a great value for gamers, sci fi fans, and otaku with the included items worth at least $27 USD (MSRP)! Get yours NOW on Amazon or CosplayFanGear.com! Specific item styles will vary for each box purchased. Exact sizes and colors will vary. Items pictured are product examples. You are guaranteed to receive the following items four (4) Pinback Buttons, one (1) Bead Pixel Art, one (1) Cross Stitch Pixel Art, and one (1) Vinyl Decal. We are excited to announce the launch of our official email newsletter! Once a month and on special occasions, we will e-mail subscribers with our latest product offerings and sales. This is a great way for you to learn about cool new stuff and save money! We are also launching THE EPIC MONTHLY GIVEAWAY! That's right. (Cosplay & Fan Gear, LLC will never sell or trade your subscriber information. No purchase necessary. Only available to residents of the United States of America with U.S. mailing addresses. Not open to entrants with international mailing addresses. The Monthly Epic Giveaway will be held every month with details being announced at least once a month at undisclosed times. Giveaway prizes will be selected by Cosplay & Fan Gear, LLC at Cosplay & Fan Gear, LLC's sole and absolute discretion. Winners will be selected by Cosplay & Fan Gear, LLC randomly from names acquired through the Cosplay & Fan Gear, LLC newsletter submission form. Winners will be notified via email. If the winner does not respond to Cosplay & Fan Gear, LLC's email within five (5) business days, the prize will be forfeit. Prizes will be mailed out via United States Postal Service (USPS) First Class Mail with a tracking number. Cosplay & Fan Gear, LLC does not guarantee a timely delivery of the prize because USPS does not guarantee a delivery time frame for First Class Mail. Winner names will not be posted unless the winner authorizes their name be revealed publicly. Authorized winner information will be posted each month at an undisclosed time along with the next giveaway on the Cosplay & Fan Gear, LLC Blog (blog.cosplayfangear.com). 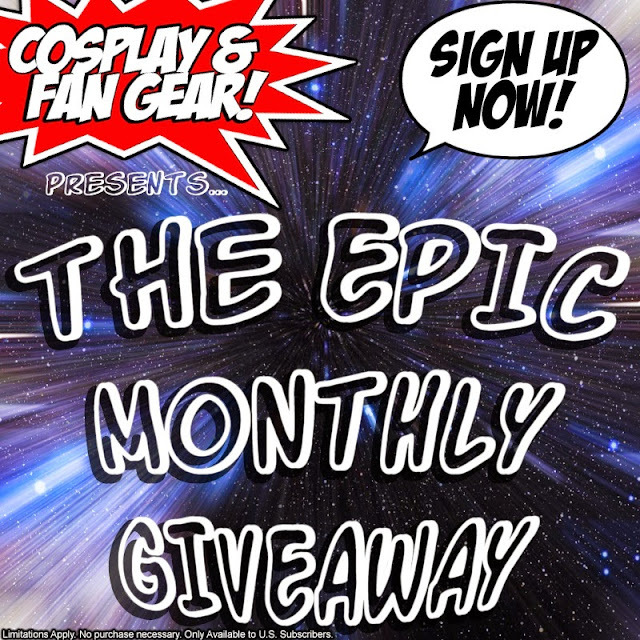 The Monthly Epic Giveaway is being sponsored by Cosplay & Fan Gear, LLC, 7000 N 16th St. #120-465, Phoenix, Az, 85020.